We all know online shopping in India is growing at a very fast clip. At the same time, there is an intense competition in ecommerce space, especially among the top 3 players. Another aspect that everyone is probably aware about is, all this aggressive pricing and discounts are being paid by Venture Capitalists’ pockets. Flipkart, Amazon and Snapdeal, all of them have raised investments or have commitments of $1 Billion or more. This money is being burned to acquire new customers, offer discounts and pump up products on offer. While we are all aware that these sites are losing money, you will be amazed to know the quantum of loss these ecommerce players have incurred. 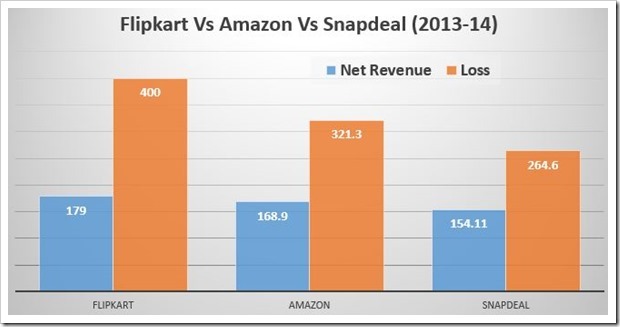 Flipkart leads the race with net revenue of 179 crore followed by Amazon at 168.9 crore and Snapdeal at 154.11 crore. However, when it comes to losses, Flipkart leads by a much bigger margin and their loss for 2013-14 stands at Rs. 400 Crore. Comparatively, Amazon losses are pegged at Rs. 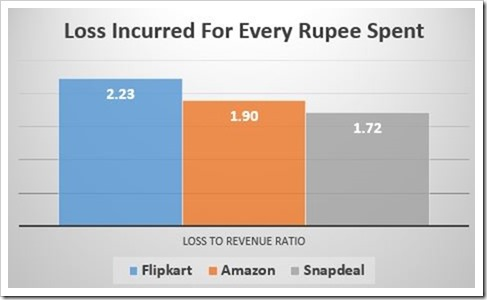 321.3 crore and Snapdeal had least losses of 3 with 264.6 crore. A survey of our says, Flipkart have replicated the role of the distributor/wholesaler and the retailer in the traditional brick-and-mortar supply chain; if the margin available to these two components (distributor and retailer) covers the operating costs including logistics, then it is definitely a viable business, it added. The future of online retailing market to grow 10 times to range between $48 billion to $60 billion by 2020, based on internet penetration, per capita GDP, and total retail market size in the country. The study shows that online retailers to turn profitable by 2020 as operating costs (as a percentage of GMV) are likely to decline by an estimated 400 basis points. Further, the discounts offered by the firms are expected to drop by an estimated 700-basis-point (as a percentage of GMV), which will become catalyst to earn profits. Discounts will come down as growth moderates from current supernormal phase (to attract more consumers) to moderate growth phase (more users buying online for convenience, choice, etc.). Flipkart acquisition strategy is also very impressive. They acquired two most famous e-commerce company “Myntra nad Jabong” in an effective cost. The company is expecting Myntra unit to turn profitable in fiscal 2017. Adult-Related Markets- The Largest Online Profit Bearers?